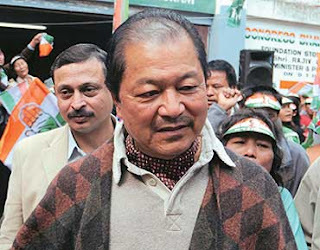 Aizawl, Jun 6 : All three major opposition parties in the state have demanded the resignation of chief minister Lalthanhawla, who also holds the public works portfolio, and his younger brother, Lalthanzara, parliamentary secretary of the public works department (PWD). The parties hold the duo responsible for the "manmade disaster" that claimed 17 lives in northern Aizawl on May 11. Mizo National Youth Front (MNYF) president PC Laltlansanga, Mizoram People's Conference Youth (MPCY) president V L Zaithanzama and Zoram Nationalist Party Youth (ZNPY) president Joseph L Ralte issued a joint statement on Wednesday. They alleged in the statement that Lalthanhawla and his brother were responsible for the deaths as it was an abandoned PWD office building in Laipuitlang locality of Aizawl that swept away nine houses, killing 17 people. The statement also alleged that the PWD did not act even after cracks appeared on the ground near the building in October 2012, despite repeated warnings from local council leaders. This eventually resulted in the disaster. "If transport minister P C Zoramsangliana submitted his resignation following an accident of a Mizoram State Transport bus and education minister Lalsawta resigned over mistakes in the technical entrance examination, the chief minister and the PWD parliamentary secretary should also resign," the statement said. "The delay in dismantling the PWD building and the complacency of the Congress government led to the disaster and people looking after the PWD must own moral responsibility," the statement added. The opposition youth wings demanded a judicial inquiry into the incident.